A common complaint I hear from friends who want to cook Asian cuisine at home is that some key ingredients are sometimes difficult to find. For this recipe, the 'specialty ingredients' needed include hoisin sauce, Asian chili garlic sauce and rice paper wrappers. Hoisin sauce is becoming more of a common ingredient in most national grocery store chains. The Asian chili garlic sauce is an optional ingredient. If you do prefer to use it, you can use as much or as little as you'd like, depending on how much heat you want in the dish. Lastly, the rice papper wrappers is what makes this dish a tasty little package. If you can't find this item in your local grocery store, you can substitute it with wonton wrappers and fry the spring roll. Or, omit the wrapper altogether and enjoy it as a salad as is; as a lettuce wrap/cup filling; toss with cooked white or brown rice as a side dish; or use the filling inside tacos or burritos. Regardless of how you decide to enjoy the filling, take note of how flavorful the pork is with the bits of ginger, cilantro and scallions mixed in. I especially like the use of a coleslaw mix - it saves time and really adds a great, fresh texture! Combine the hoisin, soy, and chili garlic sauces and water in a small bowl. In another bowl, combine the coleslaw, cilantro and scallion greens; set aside. Heat oil in a large skillet over medium high heat until just smoking. Add pork and 1/3 cup of the hoisin sauce mixture. (The remaining hoisin sauce will be used as a condiment for dipping.) Cook the pork until no longer pink, about 5 minutes. Stir in the ginger and scallion whites and cook until fragrant. Place this pork mixture into the bowl with the coleslaw, cilantro and scallion greens. Toss to combine. Spread a clean, damp kitchen towel on the counter. Soak a rice paper wrapper in a shallow bowl of warm water, about 10 seconds, and spread out on towel. Arrange 1/2 cup of filling on each wrapper, leaving a 2 inch border on the bottom. Fold in sides and roll up tightly like a burrito. Repeat with remaining wrappers and filling. Serve with the remaining hoisin sauce mixture for dipping. Looks great! I have a package of ground chicken that needs to be used. Do you think that would be a good sub for the pork here? Anonymous - I think ground chicken would be a delicious substitution! Enjoy! Your blog has become my go-to cookbook. I've made several of your recipes and All have been really delicious. I think these spring rolls will be on the menu this weekend. Yum, I love spring rolls. Have not had rice paper variety for yonks. I'll have to try your recipe, thanks. I love spring rolls, and the fillings that you can do in them to please even the pickiest of guests. Thanks for the finger licking idea for my next adventure in the kitchen. I love, love spring rolls. I would never think of using coleslaw mix. I would have just chopped all the veggies and cursed the whole time. I usually just use bbq'd chicken or poached shrimp along with seasoned (with seasoned rice vinegar that is used in making sushi) rice vermicelli noodles, bean sprouts and sliced avocados in my summer rolls. Thanks for the new idea. Will definitely give it a try. 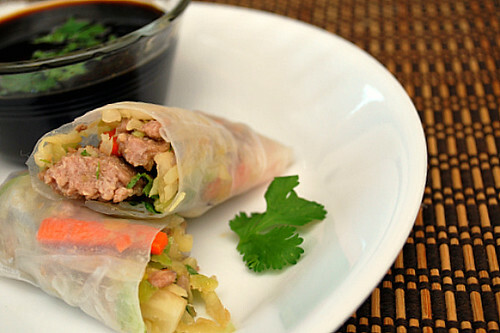 I used this recipe as a jumping off point for a gingered beef spring roll ... SO good!